Moraga Education Foundation (“MEF”) is pleased to announce that it is currently evaluating professional asset management firms to manage the MEF’s Endowment Fund (“MEFEF”). MEF’s goal for the Endowment Fund is to create a long-term stable source of money that will help protect public schools in Moraga from volatility in state funding. MEF’s expectation is for MEFEF to receive annual contributions as part of MEF’s ongoing fundraising efforts. MEFEF’s investment horizon is long-term and though permissible at current Endowment Fund levels, MEF has no current plans for withdrawals from MEFEF. MEFEF’s Investment Policy Statement is attached hereto. Please see MEF’s website at http://www.moragaeducation.org for additional information that you might find useful as you prepare your response. In order to be eligible for consideration submit a Solicitation of Interest Questionnaire to MEF’s Executive Director Kim Matranga at mef@moraga.k12.ca.us. PLEASE NOTE: All submissions must be received no later than 5:00 PM on April 30, 2019 and must be filled out completely to receive consideration. Submissions will be treated in confidence and MEF will not return any information provided as part of the review process. What a fantastic community we live in! We rally together to build playgrounds, fund and watch fireworks, find lost dogs, and engage in civil discussion. In addition to this wonderful small town feel, many families, including our own, moved to this area because of the excellent public schools and our shared values about the importance of education. In fact, this community’s commitment to public education and spirit of generosity helped us raise just over $2,200,000 for the second straight year. Thanks to the nearly $200,000 in proceeds from our second annual fundraising gala, we were able to increase our grants to the schools for the 2018-2019 school year by over 10% from the prior year to $2,250,000! That is because of you - our donors, our business and civic sponsors, and our volunteers. Each year, you help us bridge that all-important gap between the state funding our schools receive and the actual cost of educating our students. As a result, our schools remain consistently ranked in the top 1 percent of California public schools. MEF will continue to fundraise to sustain vital staff and programs and rely on you to help us reach our goal. It is a privilege to be a part of this amazing community, dedicated to our children, that works hard to maintain these opportunities for every student, every day. 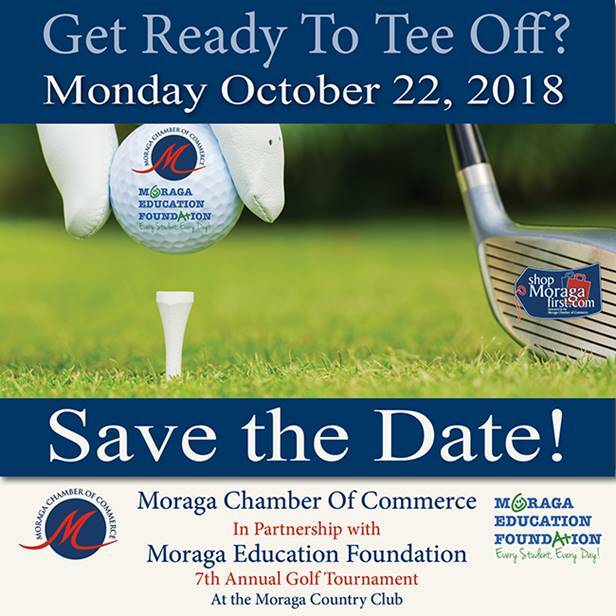 The Moraga Chamber of Commerce is hosting a Golf Tournament to benefit the Moraga Education Foundation. Come on out for a fun day on the links while supporting the Chamber of Commerce and the students in the Moraga School District and Campolindo High School. What a year it has been! The 2016-2017 campaign, celebrating MEF’s 35th anniversary, was a year of honoring the past and inspiring the future. I can’t think of a better way to honor that legacy than by reaching our fundraising goal of $2,200,000. This commitment to supporting excellent educational opportunities for all Moraga public school students was reconfirmed by an outpouring of support from parents, community members, and business & civic sponsors. It is a privilege to be a part of a community, dedicated to our children, that works hard to maintain these opportunities for every student, every day. In March, the MEF 35th Anniversary Auction & Dinner Dance was an amazing evening of celebration and inspiration. For the first time in MEF’s history, an event dedicated to fundraising for the Foundation was held in honor of this important milestone. It was humbling to see such generosity from sponsors, donors, bidders, and volunteers. By the end of the evening over $210,000 had been raised, which made it possible to reach the MEF Endowment Fund’s initial goal of $1,000,000. Truly an inspiring moment for students to know their community was investing in their future. As we look to the 2017-2018 campaign, the reasons MEF was founded over 35 years ago largely remain the same; to bridge the gap between the state funding our schools receive and the actual cost of educating our students. The reality is, quality public education isn’t free and our districts don’t receive adequate money from our state. In the coming year, our districts will be in deficit spending, and anticipate that to continue, due to rising education costs without increased state funding. MEF will continue to fundraise to sustain vital staff and programs and rely on the community to help us reach our goal. On behalf of Moraga’s public school students, I would like to express my appreciation for your investment in their education. What a privilege it has been to see this community honor MEF’s legacy and inspire future generations of students.